Version 2.3 of Jetpack has launched! New features like Omnisearch, Social Links, the Debugger, and more give you powerful, simple ways to customize and administer your Jetpack-powered site. Omnisearch: one search box, global results. Don’t waste time digging for that one comment with the useful link — or was it a post you saw it in? 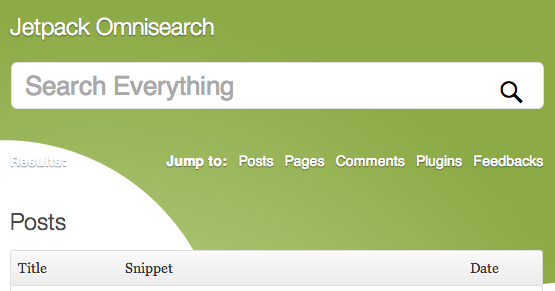 Search once and get results from all of your posts, pages, comments, and plugins. It’s also incredibly simple to let other plugins offer search results for when a user does a search. Do you have a plugin to build forms? Let Omnisearch provide your users with relevant points of contact from their visitors. Shopping cart plugin? Use it to find individual orders or products. Omnisearch is easy to extend via WordPress’s native Filters API to create a comprehensive search experience within your Dashboard. Are you using a theme that supports Social Links? Now, you can configure your social icons directly from the Customizer (just make sure you’ve connected your social services using Publicize first). Debugging your Jetpack connection has never been easier. Activate the Jetpack Debugger, find out why Jetpack isn’t working for you, and submit a help request directly from your Dashboard. Our support folks can see the test details, helping them hone in on the issue more efficiently. If you’re already running Jetpack, head to your dashboard to update to 2.3. Otherwise, download Jetpack today! This entry was posted in Features, Releases and tagged Debugger, Jetpack, Omnisearch, Publicize, Social Links, WordPress. Bookmark the permalink. Sounds like an excellent update. Look forward to trying it! Omnisearch is pretty cool! I can see myself using it to find all posts with a certain shortcode, for example. Jetpack has become an indispensable part of all the sites I build. I appreciate the improvements! Wow, fantastic. Thanks you guys. One noob question: I see that 2.3 is available now in the repository, but I’m not yet being prompted to update from 2.2.5. When I click “update” I believe I maintain all my existing settings. If I download 2.3 and then upload it will I lose settings? TY! It can take a little while for the update to appear in your WordPress dashboard. I would suggest that you try again in a few hours, since that’s probably the easiest way to update! Its cool, but when will it search attachments and custom post types as well? Just remember that this new method won’t be available until v2.3.1 releases, or you’re running trunk (which we don’t advise). I updated it on about ten sites, and all updates still show the update notice (the white 1 in a dark circle next to Jetpack in the sidebar) on all sites. What more needs to be done, or is this some kind of a display bug? This small notification is to show you that new modules were added to your Jetpack; visit the Jetpack menu, and the notification will disappear. I did exactly what you say – visited the Jetpack menu, activated/deactivated the new modules, etc., but the notification is still there. Could you contact us via email so we can have a closer look at this issue? I found that the problem is caused by a plugin, called ‘Manual Control for Jetpack’. Deactivating it resolved the issue.